A team of drainage engineers from UKDN Waterflow has boosted the flood resilience of a large supermarket after it was left three feet under water when a river burst its banks. The store in the north of England, part of a national chain, was inundated during Storm Desmond in December. Water from the river flooded the site because it was in a low-lying area not covered by flood protection measures. 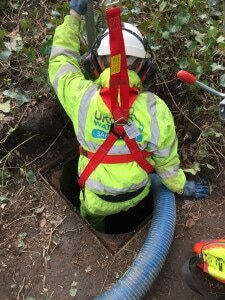 UKDN Waterflow, part of Lanes Group, was called in to clean and repair the site’s drainage system as part of a package of flood recovery measures. A multi-skilled team of drainage engineers was deployed, and worked to challenging deadlines set by the supermarket chain so it could set up a temporary store on the site as soon as possible. Richard Sherwood, UKDN Waterflow Business Development Manager, said: “This project shows how we can mobilise quickly to respond to complex emergency drainage problems. In one example, the UKDN drainage engineers fitted non-return valves to pipes leading to two interceptors. This will prevent flood water forcing its way through the pipes and into the surface water drainage system, from where it could flood the car park and threaten the store. They also repositioned the telemetry control box for the foul water system pumps, moving it to a higher position, so it was less likely to be affected by flood water. UKDN Waterflow deployed a CCTV drainage survey team, a drain blockage unit, a jet vac tanker, a Terra Jet off-road jetting unit, and an excavation team to the site. Water jetting and pipe rodding was carried out to clear drainage pipes left heavily silted up once the flood water subsided. Grease was also flushed out of the foul water system, and rust was removed from cast iron pipes. The Terra Jet remote hose reel was deployed to continue this pipe cleaning work across rough terrain leading to an interceptor located close to the river, which was found to be buried, and had to be uncovered by the excavation team. Additional concrete rings, a new frame and a heavy duty cover were installed to bring the manhole to the interceptor up to ground level. Two patch liners were also installed in pipes which the CCTV drainage surveys found to be partially collapsed. This technique, called CIPP (cured in place pipe) lining, allows drainage pipes to be repaired without costly excavations.